Last Saturday, a little retro hole-in-the-wall was turned into an old-fashioned dance party, with cupcakes and all! The restaurant-bar is called Jang Bang. Old record covers adorn the walls, beer is served in mason jars and the menu offers Korean tacos. On this night, my dear friend Whitney turned the joint into Jang Bang Soul Train, a fundraiser for the Children's Book Bank, and I donated some treats to go with the bubble-gum cupcakes she made. The night was a hit, you'd be surprised how much drunk people want cupcakes! For the crust, mix all of the ingredients into a large bowl until the crumbs absorb all of the butter. Add a large spoonful into each cup and firmly compress to the bottom. I used the bottom of my 1/4 cup measuring cup to press down with. Bake for 10 minutes at 350 degrees or until the edges begin to brown. Cool in the fridge when finished. For the filling, blend all of the ingredients in a food processor. To leave room for the blueberries fill each cup about 3/4 full. Bake at 350 for 30 minutes. Turn off the oven and let them sit inside for another 30 minutes. This will leave the tops nice and flat. Let them finish cooling in the fridge before icing. If you're using homemade mascarpone for the icing, prepare it at least one night before. For the rest of the ingredients, blend them in a food processor. You can add the icing sugar to taste. If you want more of a cheesy taste add less, if you want it sweeter add more. Mix it with the mascarpone by hand or with a processor. Before you cover the cupcake with blueberries spread a thin layer of the icing on top of the cupcake. This will help the blue berries to stay in place. To achieve the flower effect, I used an icing gun that comes with different tips. The crust and the icing are done the same way for each type of cupcake. As before, blend all of the filling's ingredients in a food processor and fill each cup 3/4 full. Spread a thin layer of icing on top of the cupcake and place the rasberries with their holes facing up. I used the same nozzle for these petite flowers as I did with the large one above. It's the nozzle that is rounded at the end and has spikes facing its opening. To achieve these small flowers gently push for the icing to come out and quickly bring the nozzle upwards when get the desired amount. 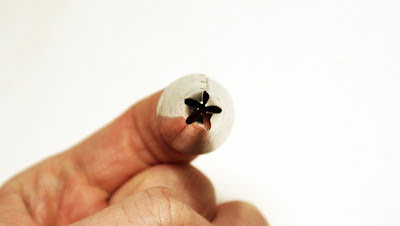 This helps to avoid the nozzle from dragging the flower with it, since its very light. Make the icing and the crust the same as the other cupcakes. For the filling, melt the butter in a stove-top pan until completely dissolved. Add the cocoa and remove from the heat, stirring it until all of the cocoa has melted. In a food processor blend this mixture and the rest of the filling ingredients. Taste for sweetness, if its too bitter for your liking add more sugar, the cocoa has a very strong taste. Again, fill the cups 3/4 full. For the topping grab a handful of about8 or so marshmellows and clump them together with a small spoonful of the icing you made earlier. On a greased baking sheet place each clump about an inch apart. Broil them at 400 degrees for about 20 or 30 seconds. You can keep the oven door open and carefully watch them. You'll see the start to brown, so remove when they are cooked to your liking. Before you place them on the cupcakes add a small smudge of icing to the top of each cupcake. Don't spread it over the whole surface, you want to see the colour of the cupcakes. This smudge will help the marshmellows hold better. You also don't need to let the marmellow clump cool completely, you want them to dry a little to the cupcake. Use a knife or spatula to lift and place on top, and voila!